1.1. The general terms and conditions of sale are applicable to all orders for services that are placed with SOS 247, established at Avenue Jules Bordet 160, 1140 Evere, hereinafter referred to as SOS 247.1.2These general terms and conditions of sale are the only applicable ones, with the exception of the general or particular terms and conditions of the client that SOS 247 has not expressly accepted in writing.1.3. SOS 247 may modify these general terms and conditions of sale at any time. However, the conditions communicated at the time of the order remain applicable for this order. The customer is deemed to have become aware of this, to have accepted all the clauses and to have renounced to avail himself of his purchase conditions.2.1.Unless otherwise stipulated in the special conditions of SOS 247, the validity period of our offers is one month.2.2. Any order that has not been preceded by a written offer from SOS 247 will only be binding on the company if a written acceptance has been sent by SOS 247.2.3. Our agents or representatives do not have a power of representation. The sales they negotiate therefore only become firm after SOS 247 has sent a written acceptance of the order.3.1. The prices of SOS 247 are denominated in euros, excluding VAT. Any increase in VAT or any new tax that may be imposed between the time of the order and the time of delivery will be charged to the customer.3.2. The prices of SOS 247 only apply to the provision of services described in the special conditions, to the exclusion of all other work and services. If these are ordered by the customer, they will be invoiced in addition to the price provided for in the special conditions.3.3. Depending on the degree of unhealthiness for work performed, the legal surcharge will be applied to our intervention packages. 3.4. The use of machines for specific work such as uncorking, drilling, descaling as well as the use of scaffolding, nacelles, large ladders and others are not included in our hourly rates and will be subject to additional invoicing.3.5.The services resulting from examination, disassembly, reassembly, possible transport are always the responsibility of the customer even if he renounces to have the work for which we have been consulted carried out. An intervention can be expensive. It all depends on what needs to be done on the spot.3.6.Any hour as well as any quarter of an hour is due. A price increase of 50% will be applied for services performed between 6pm and 10pm, and 100% for services performed during the week from 10pm to 8am, weekends, public holidays and legal holidays.3.7. Packages for emergency work not including travel start at 350€ per hour or per package and are established at the place of intervention according to the nature of the work requested by the client in writing or verbally. These generally include troubleshooting, repair and various trips related to the acquisition of spare parts from suppliers.3.8. The amount of the trip can go from 90€ to 450€ from 8am to 6pm and from 180€ to 450€ for the hour range from 6pm to 8am only in emergency even in the event of a repair that cannot be solved. 3.9. The trip is due in all cases, even for quotation or without intervention or cancellation by the customer from 30 minutes after the request for intervention in the context of an express request for intervention to intervene on the same day of the request.3.10. The first hour of intervention is 350 € between 8 am and 6 pm and 350 € after 6 pm.3.11. There is an additional charge of 120 € when there is an emergency intervention.4.1. Invoices are payable in full cash, in the invoicing currency, at SOS 247' registered office (IBAN: BE48 0015 2111 7927). 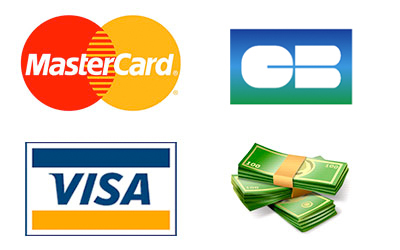 In addition, it will also be possible for the customer to pay either in cash or by bank card. 4.2. Principal: the person who ordered the work from us is responsible for its payment.4.3. Any complaint relating to an invoice must be sent in writing to SOS 247' registered office seven calendar days after receipt. Otherwise, the customer will no longer be able to dispute this invoice. 4.4. In the event of non-payment of an invoice on the due date, payment of all invoices will become immediately due. 4.5. Any reminder sent to the customer who has not paid the integrity of his invoice may lead to an increase in costs by post, without prejudice to any costs of our collection agency (intrum justitia) which will also be charged to the customer. The fee to be paid in case of late payment is 10% of the amount with a minimum of 50€ and 8% interest. 4.6.The customer may not invoke the execution deadlines to request termination of the contract, claim damages or any other claim, unless otherwise expressly accepted in writing by SOS 247. 5.1.The customer shall take special care to ensure that the work area is accessible, and that the installation and storage areas for materials are clean and clear.5.2.The customer will provide our staff with a city pressure water supply and a grounded and fused power supply for the duration of the work. 5.3.The buildings where the work will be carried out and their contents will be insured by the client against the risks of fire, theft or vandalism up to the amount of sufficient capital. The client releases us from any liability in this respect. 5.4.Services: the client is urged to take into account the entry and exit times, the duration of the round trip, which vary according to the circumstances, the movement of the vehicle, the handling of the file, the time required to prepare the material and tools, as well as their re-installation; elements that define the total duration of the service. Unless otherwise stipulated in SOS 247' special conditions, the guarantee is valid for the entire duration of the contract, unless otherwise stated. 7.1.SOS 247 declines all responsibility in the event of an interruption of service beyond its control. Force majeure: any circumstance beyond our control that prevents us from fulfilling our obligations authorizes us to cancel our contracts in whole or in part without compensation and exempts us from liability. This is the case, but not limited to, the defect in equipment, failure to deliver the subcontractor or supplier, failure of the subcontractor or supplier, bankruptcy of the subcontractor or supplier, power or water failure, strike, war, riots, bad weather, fire, machinery or vehicle breakdown.7.2.When the provision of services is completed, SOS 247 no longer assumes any responsibility for the consequences of its intervention, as defined in the service offer. 7.3.In any case, SOS 247 liability is limited to the amount of the contract. 7.4.The customer assumes full responsibility towards third parties, and especially neighbours, for damage that is the inevitable consequence of the execution of the work, if no fault can be attributed to us. 7.5.Any disassembly is carried out under the exclusive responsibility of the customer. The client assumes the risks of the configuration of the premises and compliance with existing standards without SOS 247 or its personnel being held liable in any way whatsoever and for any reason whatsoever. 7.6.We shall not be liable for damage caused by soot if no specific fault can be attributed to us. 7.7.Connections to boilers, water heaters, boilers are in all cases to be carried out and/or checked by a licensed electrician. 7.8.The unclogging of the pipes is considered to be perfectly executed when the technician has the customer repeatedly state that the flow is free, and has the customer sign his service voucher. 7.9. The intervention, delivery and execution times are given as an indication without obligation on our part. Any modification of these cannot be invoked by the client to justify a refusal of payment or a claim for damages. The Service Provider undertakes to process personal data in accordance with the law of 8 December 1992 on the protection of privacy with regard to the processing of personal data, as amended by the law of 11 December 1998.9.1. SOS 247 is entitled to terminate the sale, ipso jure, by registered letter, in the event of serious breach by the customer of one of its contractual obligations, in particular if it is in arrears with the payment of an invoice for more than thirty calendar days or if it appears that it will not perform or seriously risks not performing one of its main obligations, even before this obligation is due.9.2. In the event of termination of the sale pursuant to the above paragraph, the customer shall be liable to SOS 247 for damages fixed unilaterally (sale price or hourly price). 9.3 Retention of title and termination clause: Materials and parts of any kind supplied to the customer in the context of a sale or contract of enterprise shall only become the property of the customer after full payment of all claims against him. In the event of the client's bankruptcy, the client will be obliged to immediately inform the management of SOS 247 so that it can take advantage of its retention of title clause and initiate its claim action before the closure of the claims report. It is expressly agreed that any movable property sold or placed by SOS 247 may not be considered as immovable by incorporation.9.4. By signing the intervention form, the client or his representative waives the right to dispute the reality of the performance of the services included therein. Any absence of the client at the time of signature constitutes acceptance of the services provided.10. Any dispute or claim must have been received by registered letter within 48 hours of the end of the work ordered or the delivery of the materials, after this period, there is foreclosure. Any dispute directly or indirectly relating to SOS 247's contractual relations with the client is the exclusive competence of the Courts and Tribunals of Brussels sitting in French. Any sale of the Company's products or services is governed by Belgian law. Displacement from Monday to Friday from 8am to 6pm: from €90. Displacement from Monday to Friday from 6pm to 8am: from 120 €. Displacement on weekends and public holidays: 180 €. Intervention: this depends on the nature of the intervention. For any appointment, no emergency supplement. Possible increase of 50% on labour on weekends, public holidays. As well as the week after 6pm. Diagnosis before repair: from 95€. Replacement water heater: from 850 €. Replacement boiler: from 850 €. Replacement of a 24 kW boiler: from 1500 €. Replacement of a radiator: from 650 €. For any other installation: on request.